In the decades following Meyer’s successful assault on Kili, few followed in his footsteps. Meyer himself climbed again in 1898, though this time he got only as far as the crater rim. In 1909 surveyor M Lange climbed all the way to Uhuru Peak, and in doing so became only the second person to reach the summit of Kilimanjaro – a full twenty years after the first.The conquest of the last peak on Kilimanjaro, that of the summit of Mawenzi (called, somewhat perversely, Hans Meyer Peak), was achieved by the climbers Edward Oehler and Fritz Kluteon 29 July 1912. Thus, 64 years after the first European had clapped eyes on Kilimanjaro, both of its main peaks had been successfully climbed. As an encore, Oehler and Klute made the third successful attempt on Kibo and the first from the western side. In the same year, Walter Furtwangler and Ziegfried Koenig achieved the fourth successful climb, and became the first to use skis to descend. Two more successful assaults occurred before the outbreak of World War One, and Frau von Ruckteschellkept up the German’s impressive record on Kilimanjaro by becoming the first woman to reach Gillman’s Point. Fresh attempts on Kilimanjaro were suspended for a while during World War One. The countryside around Kilimanjaro became the scene of some vicious fighting, including Moshi itself, which was attacked by British forces in March 1916. 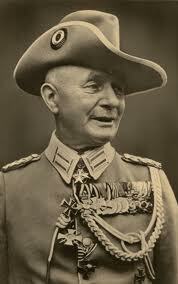 Paul von Lettow Vorbeck, the German commander, went down in military history at this time as the man who led the longest tactical retreat ever. With the German’s defeat, however, Kilimanjaro, along with the rest of German East Africa, reverted to British rule. After the war, attention turned away from Kibo to the lesser-known Mawenzi. In 1924 George Londt of South Africa became, by accident, the first to climb South Peak (he was aiming for Hans Meyer Peak but got lost); the peak (4958m), was named after him. Three years later three English mountaineers climbed Mawenzi, including Sheila MacDonald, the first woman to do so; the trio then climbed Kibo, with Ms MacDonald writing her name into the record books again as the first woman to complete the ascent to Uhuru Peak. In 1930 two famous British mountaineers, HW Tilman and Eric Shipton, names more usually associated with Everest, climbed Mawenzi’s Nordecke Peak – again, like Londt, by accident. While all this was happening on Mawenzi, over on Kibo another man was writing himself into the history of Kili: Pastor Richard Reusch. Missionary for the Lutheran Church, former officer in the Cossack army and long-time Marangu resident, Reusch climbed the mountain on no less than 40 different occasions. During his first assault on the summit in 1926 he discovered (or rediscovered, there being some dispute as to who saw it first) the frozen leopard on the crater rim that would later inspire Hemingway (Reusch cut off part of an ear as a souvenir), while on another sortie the following year he became the first to gaze down into the inner crater, a crater that he was later to give his name to. Later work by mountaineer HW Tilman and vulcanologist JJ Richard led to confirmation, in 1942, that Kilimanjaro was still active, and while this led to some local panic, in 1957 the Tanganyika Geological Survey and the University of Sheffield were able to allay fears by declaring the volcano to be dormant and almost extinct.